Updated, Nov. 10, 2012 -- Soon after I posted this, I learned Flores had been released late Friday. She told CubaNet that she was in good condition and had not been physically abused by her captors. Her interrogators did warned to quit reporting "aggressively" about events in Cuba. Numerous dissident bloggers, writers and other activists, including Yoani Sanchez, were arrested and temporarily detained this week. Standing up for one of their own, Yaremis Flores, a lawyer, journalist and blogger arrested and charged with a made-up crime -- "disseminating false information against international peace" -- apparently in response to her recent accounts of detentions of other journalists and criticisms of the Castro government's response to Hurricane Sandy. New York, November 9, 2012--Cuban authorities charged journalist Yaremis Flores with anti-state crimes on Wednesday in connection with news articles critical of the government, an arrest that sparked two waves of protests and detentions outside a Havana police station. The Committee to Protect Journalists called on authorities to drop the charges against Flores immediately. Flores, who is also a lawyer and former judge, had reported on the recent detentions of journalists and detailed local criticism of the government's response to Hurricane Sandy in articles published by the Miami-based news website Cubanet. On Wednesday afternoon at around 2 p.m. she was arrested and charged under penal code Article 115 with "disseminating false information against international peace," according to Elizardo Sánchez Santa Cruz, president of the Cuban Commission on Human Rights and National Reconciliation, and Laritza Diversent, a lawyer and blogger. 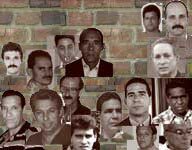 Later that afternoon, a group of journalists, and activists went to a police station in Havana to get information about Flores' status. At least 11 were arrested, including Diversent, according to the human rights commission. The following day, another group of journalists and dissidents went the police station to protest the detentions. At least 16 were arrested, including bloggers Yoani Sánchez, Orlando Luís Pardo, Eugenio Leal, Julio Aleaga, Angel Santiesteban, and journalists Guillermo Fariñas and Iván Hernández Carrillo, according to the human rights commission. Shortly before being arrested, Yoani Sánchez told CPJ that the protests were peaceful but plainclothes officers were trying to intimidate the demonstrators. A video shot by the independent news agency Hablemos Press shows Yoani Sánchez and other protesters arguing with the officers before being detained. All but one of the protesters were released on Thursday. Diversent told CPJ that she was held for 23 hours in unsanitary conditions. "Cuban authorities talk about reform, but they still treat simple criticism of government activities as a crime," said Carlos Lauría, CPJ's senior program coordinator for the Americas. "Yaremis Flores should be released immediately, the charges against her should be dropped, and any protester still in detention should be freed." Yoani Sánchez was briefly detained in October, along with her husband, the journalist Reinaldo Escobar, and the blogger Agustín Díaz. They were on their way to cover a trial related to the motor vehicle death of dissident Oswaldo Payá. Despite fewer long-term detentions of journalists in recent years, Cuba remains one of the world's most censored countries, according to CPJ research. The government persecutes critical journalists through the use of arbitrary arrests, short-term detentions, beatings, smear campaigns, and surveillance, according to CPJ research. Read Flores' and Diversent's blog, here.